We have the knowledge and integrity of only offer the best dog and cat food, treats, and toys available. 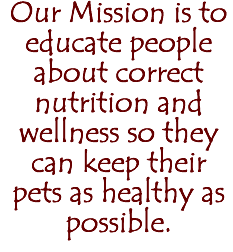 With over 20 years of experience, we offer sound nutritional advice for promoting the overall wellness of your pet, as well as a variety of conditions such as skin allergies, cancer, yeast conditions, urinary tract disease, diabetes, and seizure disorders. Healthy Choices for Your Dog! We offer many different types of Diets to choose from including raw frozen, Dehydrated, freeze dried, canned or kibble. We’ll help you choose what is right for your dog. Choose a diet that not only is healthy for your dog but also fits your lifestyle. Price and convenience are also factors to consider. Choose the best diet that you can afford. Healthy Choices for Your Cat! 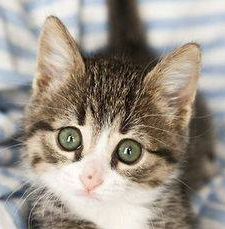 Even the most finicky cat will be happy with the choices We offer. Weather frozen, freeze dried, canned or Kibble, we will help you find the best diet for your cat. Keep in mind the moisture content as well as protein, fat and fiber. Choose a diet that not only is healthy for your cat but also fits your lifestyle. Price and convenience are also factors to consider. Choose the best diet that you can afford. If you’re looking for a high quality food to feed your dog or cat, look no further than The Honest Kitchen. This is a home cooked meal in a box! Just add water, stir, let sit 3min and serve! Your pets will love it! Although I am not a veterinarian, I have had the opportunity to gather the knowledge of literally thousand of dog's and cat's medical conditions and treatments over the last 20 years. The information I share and the recommendations I make are not intended to be a replacement for good veterinary care, but a compliment to good veterinary care.